By Charlotte Orba on April 13, 2016 in Reduce your plastic use! Lent is over which means our #PlasticChallenge is over. But is it? Can we really go back to consuming plastic like we did before? The answer is no, the WiseOceans team is now committed to reducing our plastic consumption and as a marine education organisation we want to use our experience to help others make the transition. It’s pretty difficult to be entirely plastic free but there are ways in which the use of plastic – and particularly single use, disposable plastic can be reduced. Here are our top tips and some useful links to help YOU get started. It’s by no means an exhaustive list but reflects some of our discoveries during this challenge. If only these products had their own handy packaging! Water bottles & cups: Keep hydrated (or caffeinated) without adding plastic to landfill. Just fill up your reusable water bottle and take it wherever you go. Many coffee shops now give you a discount for bringing your own mug. Straws: Enough straws are consumed EVERY DAY to go round the Earth 2.5 times! Remember to ask for no straw when you order your drink – or bring your paper/glass/metal straw with you. Plastic bags: Everyone is getting the hang of this these days. Have your reusable bags handy wherever you go. Excessive packaging: Vote with your wallet and refuse to buy items that have excessive and unnecessary packaging. Even better, tell the store manager why you haven’t bought it and/or promote it on social media. Produce bags: As well as your reusable shopping bag, take some reusable produce bags with you to the shops or market for loose fruit and vegetables. A lot of produce doesn’t even need a bag (you’re going to wash it or peel it anyway). For smaller items take a reusable bag. You can buy some mesh bags like these or make your own. Bread: You could of course make your own but that’s not always practical. 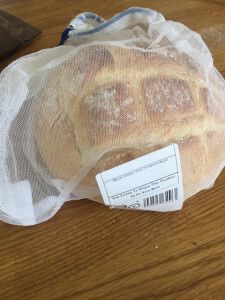 If you have a bakery close by then you should be fine to get your bread plastic free (just remember to tell them not to put it in a plastic bag for you). Supermarkets can be tricky but many have a bakery in store. The bags they use nearly always have plastic but just ask the staff for one that’s not been bagged yet. Tea & Coffee: It was a huge shock to discover tea bags had plastic in them. Even the most eco-friendly ones like Tea Pig are made from a form of plastic (PLA), which whilst it is compostable there’s some debate (an opposite view) as to how sustainable it really is. Take your container to your local tea/coffee supplier and ask them to fill it up. In the UK, Whittards were happy to fill up my container from their bulk tins. Clingfilm Do you really need to use it? Why not just put an upturned plate over your bowl of leftovers? Buy a reusable sandwich bag? Use alternative food coverings. You could use foil, but many councils don’t recycle it, and much of this resource intensive product ends up in landfill. If foil is to be recycled, it must be clean and if you’re cleaning it (it is dishwasher safe) then just reuse it. Baking parchment is an alternative for some uses and can be compostable. If you want to be more sustainable there’s a reusable alternative made from beeswax. It’s quite pricey (but does last) or make your own. Bulk buy shops: These stores are the cornerstone of the plastic free movement. You may not live close to one but there are quite a few around (North America seems to have many more). Take your own containers of course and fill up with everything from sugar, rice, muesli to nuts, spices & dried fruit. Markets: Not all market produce is good for the plastic free wannabe. 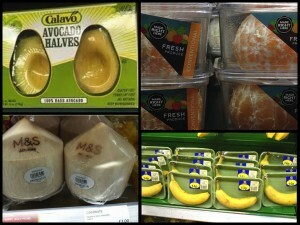 You’ll find lots of produced wrapped in plastic but you will find alternatives. I found blueberries sold loose and all common veg (apart from cucumbers and celery which seem to be impossible to find without plastic) available loose. I also found butchers who could sell me meat plastic free in my own containers. 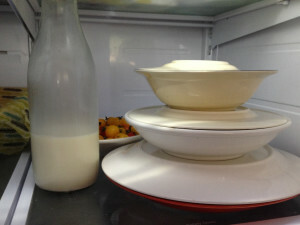 Milk: Depending on where you live you may be able to get your milk delivered in glass bottles. It’s more expensive than the supermarkets for sure but perhaps you’re supporting local dairy farmers and paying a fair price? And milk (and even cream and juice) in glass jars on your doorstep in the morning? Perfect! Toiletries: It might seem impossible to keep clean, smell nice and look beautiful plastic free, but there are some easy wins. Use a shampoo bar instead of a bottle. Buy a safety razor. Buy plastic free cotton buds. Ditch the shower gel and go back to soap (hint: posh soaps typically sold in places like TK Maxx are often packaged plastic free). Use a facecloth instead of a face scrub (you can be sure there’s no microbeads then). Use coconut oil to remove eye makeup (with reusable pads). 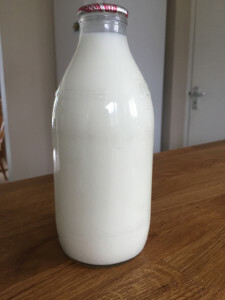 Make your own deodorant & creams (see advanced plastic free living below). If all else fails, pick the better option: Often there’s an alternative, it may not be the brand you’ve always used but is it really that different? Can you find it in a glass jar? Lids have a plastic lining but jars are very reusable. Does it come in a box rather than a plastic bag? Annoyingly many boxes (e.g. pasta) come with a small plastic window. But at least it’s less plastic. Butter is almost impossible to find plastic free (the foil is plastic lined and non recyclable) but you can find it in greaseproof type paper and this can be composted (even though some say it can’t). If it’s only available in plastic then make sure all/most of the packaging is recyclable and buy the biggest you can afford and will realistically use. Make your own deodorant: I first tried a simple recipe using coconut oil, cornstarch and bicarbonate of soda. 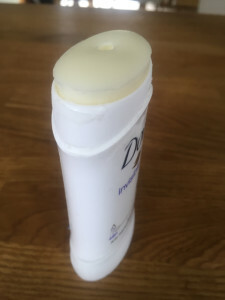 I even used an old deodorant holder so it felt like normal. After a few days where my body seemed to be adjusting (I had to reapply once or twice) it worked a treat and now I use it once a day and don’t smell…honest! It was a little soft though and would probably melt in the summer so I’m going to try a new one with beeswax. Keep an eye out for our quarterly plastic blog for an update on how this goes. Make your own hand/body cream: Now I have a supply of the relevant ingredients (coconut oil, beeswax, shea butter) I’m making my own cream. I started off using just coconut oil on my hands and face. No it didn’t feel greasy but I did find after a while that my hands were quite rough. This new cream is much better. Reusable kitchen towels: There’s no denying the convenience of kitchen roll but did you know there’s an alternative? Just bung them in the wash.
Ditch your plastic toothbrush: There are quite a few toothbrushes out there purporting to be plastic free and sustainable but this article shows you what a minefield it is. Nevertheless, there are products that will at least reduce the plastic used in brushing your teeth. Reusable feminine care products: You can buy menstrual products that are plastic free (I never even realised that tampons were full of plastic!). There are also reusable options too. It can be overwhelming when you realise how pervasive plastic is and how hard it is to live plastic free – or even plastic less. Plastic in itself is not bad (we use for all kinds of important things) but the sheer volume of disposable plastic is just not sustainable for the planet – in particular our oceans. You don’t have to change everything all at once though. We hope that our challenge and this blog will help you begin a journey of reducing your plastic consumption. Leave us a comment about the step you’re going to take next and keep up to date with us on social media and on this blog. My Plastic Free Life: Beth Terry is one of the leading lights in the plastic free movement. She has an extensive blog and has written a book. Plastic is Rubbish: This UK based blog has tons of resources for you from detailed blogs about plastic itself and lots of handy hints for making practical changes. Gippsland Unwrapped: An Australian blog with some really great articles, which will inspire you to make a change. Treading my own path: A Brit, now living in Australia with a great blog about living plastic free as well as living with less. 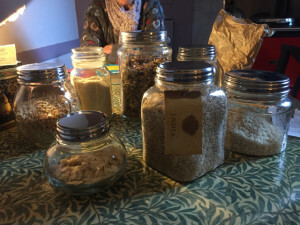 Ethical Superstore: Not everything ‘ethical’ is plastic free but you can find some good plastic free alternatives here like If You Care. Boobalou: A great UK based online shop with lots of plastic free products. Easter Fun: Kids love snorkelling as much as chocolate!